Once you have children, the romantic dinners and alone-time expectations of Valentine’s Day quickly become a thing of the past. Of course, you can always try to find a sitter… but you know as well as I that finding a sitter on V-day, New Year’s Eve or any of the other big “going out” night is next to impossible. So what’s a couple to do? Cook your own, extra special dinner at home… and invite the kids — in our case, the 5-yo boy. We also decided to all get dressed up (upon the urging of the boy), set up the dining room table with flowers, special dishes and candles and we let the 5-yo pretend to be our Maître d’ — to make it a fun night for all of us. For those of you who don’t remember, the boy is the pickiest child EVER, so coming up with a “Special Menu” that we all would enjoy was quite the challenge. Thankfully, my odd-ball-of-a-child — while he won’t eat most things normal children eat — does like a good dose of raw tuna every now and then. 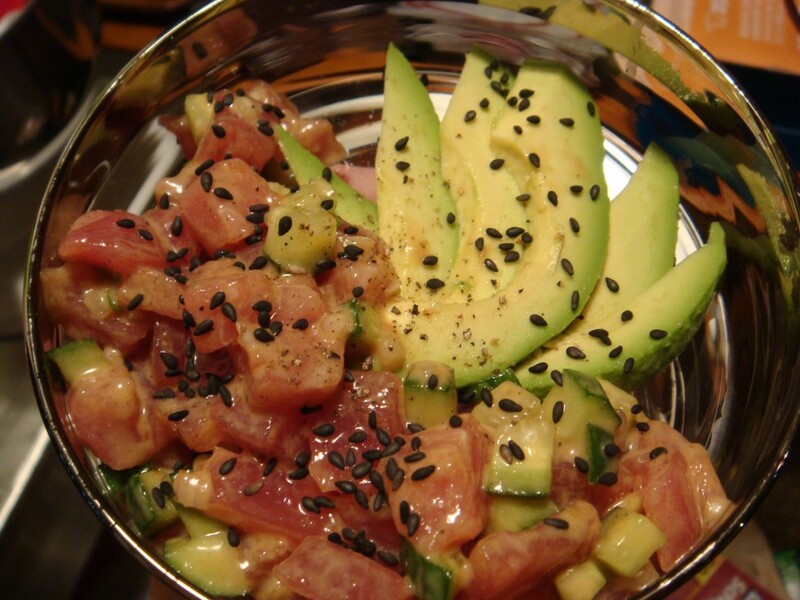 So what better to make, than my famous Tuna Tartare? I did the presentation a bit different this time, layering the avocado in the dish and serving the tuna on top of it (rather than folding diced avocado directly into the mixture). Now of course the boy will not eat anything else with his tuna… especially avocado, so I made him his own version. 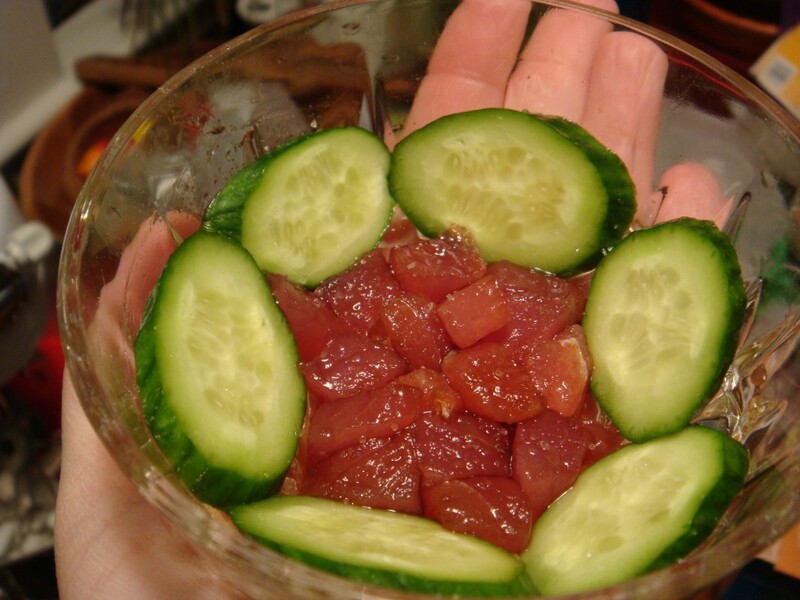 I simply tossed some of the chopped tuna with a little soy sauce and orange blossom honey and served it with a few cucumber slices. Not as nice a presentation, but he ate it all… and liked it. For the next course, I went with a simple salad of mesclun greens and mache tossed with olive oil, salt and pepper. 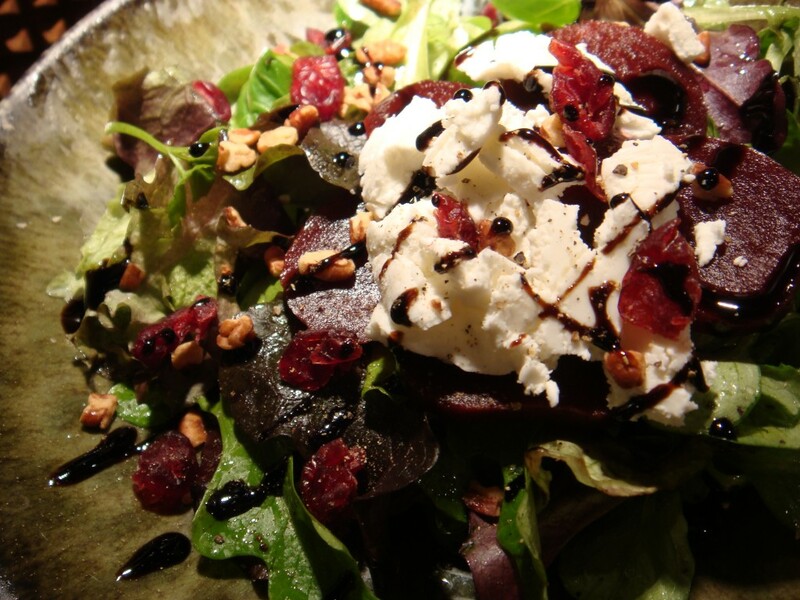 I topped the greens with sliced, roasted beets, sliced goat cheese, a sprinkling of cranberries and pecans and finished it with a balsamic vinegar glaze. I bought micro-greens to top it off… but forgot to add them! For the boy’s salad, he got just the greens, with the glaze. I will give him props though — as he did taste a peice of the beet and goat cheese (together), he just wasn’t a big fan. 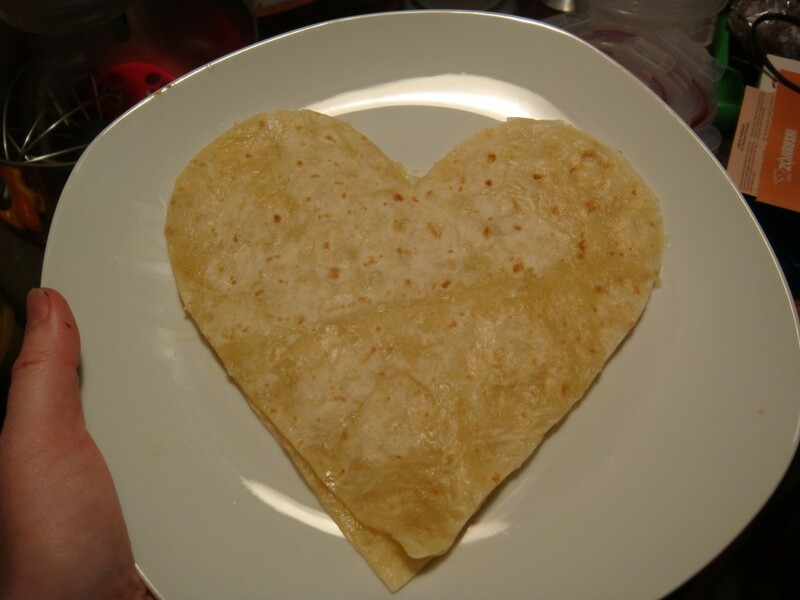 There was NO way in hell the boy was going to eat shrimp, lobster OR ravioli… so I made him a special quesadilla in the shape of a heart — stuffed with Monterrey Jack cheese only. Our dinner on the other hand, was a bit more complex. 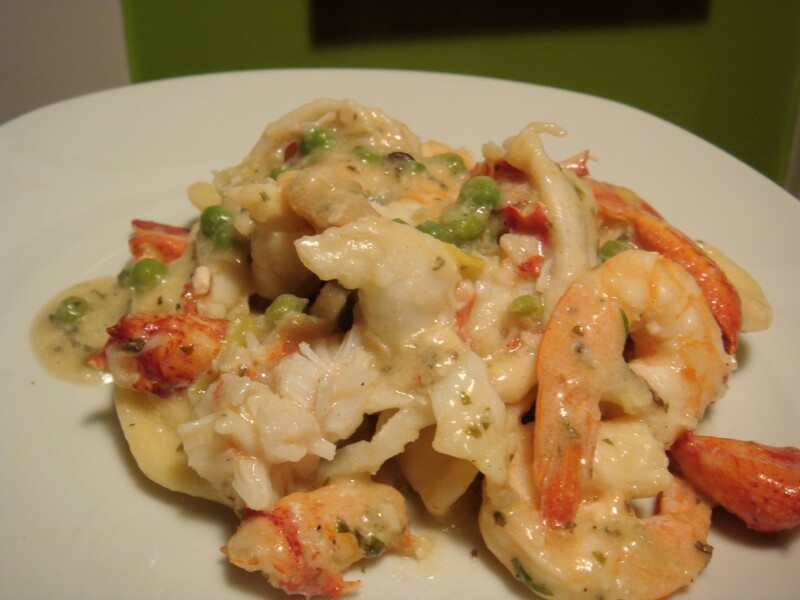 We had shrimp and lobster in a scampi-like sauce, tossed with heart-shaped, cheese-stuffed ravioli. For this dish, I tried to keep things simple by purchasing some prepared items from Whole Foods market. I was able to get a frozen package of shrimp, already marinated in scampi sauce. I also scored a pound of fresh, cooked lobster meat and pre-cooked ravioli. All I had to do was combine the ingredients, “doctor” them up and serve. In a hot saute pan, heat the prepared shrimp scampi (or make your own from scratch) until the shrimp are approximately halfway cooked. Add pre-cooked peas and continue to stir. Add the truffle butter and white wine and continue cooking until well mixed. Carefully add the mascarpone cheese, dotting little peices throughout the dish and then blending into the sauce. Add ravioli and toss to coat. Finish with white wine and continue cooking over med-low heat to thicken and reduce the sauce. When the sauce has reached the desired thickness (no more than a few minutes), add lobster meat and cook until fully heated. DO NOT overcook, as shrimp and lobster will get tough. When done, remove from heat and serve immediately. 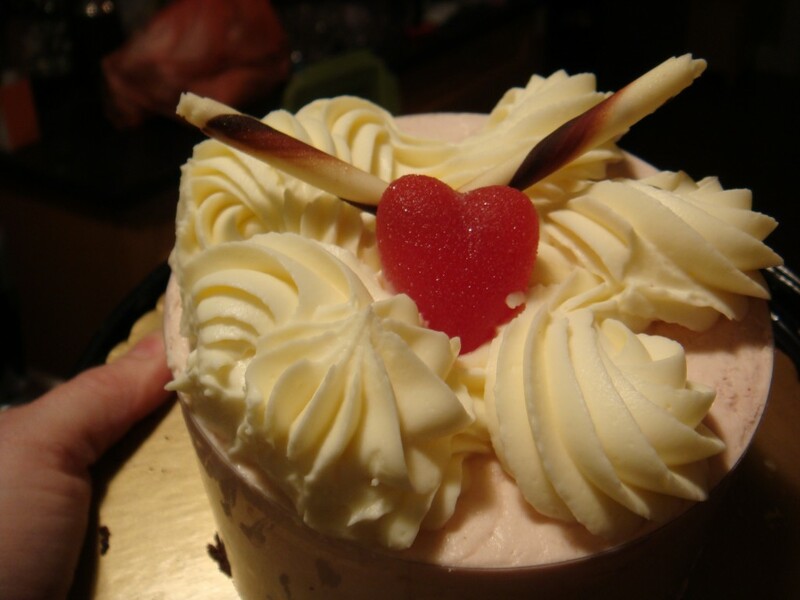 Last but not least, for desert I bought a pre-made White Chocolate and Raspberry Mousse Cake (also from Whole Foods). 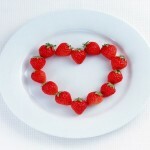 It was topped with whipped cream, a couple of chocolate straws and a gummy heart candy. 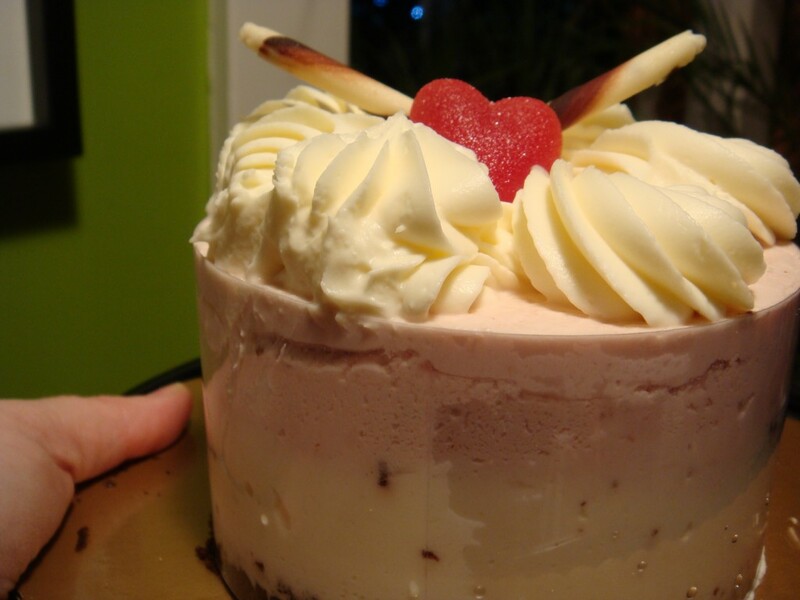 It was three layers consisting of chocolate cake on the bottom, white chocolate mousse in the middle and raspberry mousse on top. It was light, sweet and a perfect end to our special V-day dinner at home.